The olive grove forms a part of our story, and is an unquestionable element of the landscape and cultural heritage of the Mediterranean since thousands of years ago. For the Greeks and Romans, it was a totemic tree, a symbol of immortality, peace, strength, victory and hope. Its distribution around the Mediterranean occupies large areas of land, almost 5,000,000 hectares in Europe, a bit more than half of which is in Spain. Andalusia is the region that dedicates the most surface to the olive grove, with approximately 1,500,000 hectares. The province with the largest number of olive groves is Jaén. 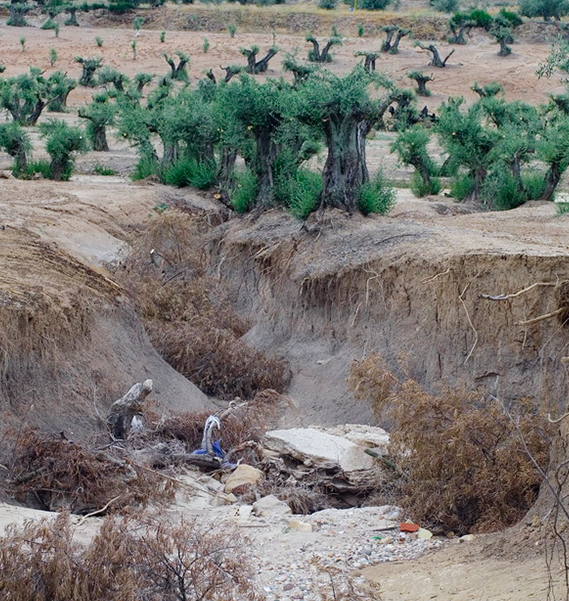 In Spain, the environmental crisis of the olive grove began at the end of the 80´s when the Common Agricultural Policy took force in our country, which caused the intensification of the olive grove and systematically eliminated all that was not olive groves, sparing no supplies (insecticides or herbicides, among others), since everything that did not produce olives was irrelevant. This process has taken an enormous environmental toll, causing the loss of a good part of the biodiversity of the olive grove and causing extensive degradation of its ecosystem services. The olive grove is a strategic crop for recovering biodiversity; due to its characteristics as a permanent forest crop, due to its distribution across the breadth of the Mediterranean basin (the main hot point for biodiversity in Europe), and due to its status as a native plant of the Mediterranean environment. In addition, it surrounds the main Protected Natural Spaces, and can act as a large ecological corridor between these spaces. The obsession for producing has led the olive grove to a situation that is environmentally, economically and socially unsustainable. The objective of LIFE Olive Alive is to reverse this situation, increasing the profitability of the olive grove by recovering its biodiversity. For this, we will collectively address the environmental and economic crisis of the olive grove through a demonstration project, capable of establishing and certifying a profitable olive growing model that is compatible with biodiversity preservation, positioning said productive model as a recognized added value, profitable in the olive market. The olive that we grow today comes from a wild indigenous species of the Mediterranean, the acebuche (Olea europea). This native origin of the olive makes it a well-adapted tree that has been weaving relations with other natural species in our environment for thousands of years, conforming a humanized forest with high biodiversity values. Relentless intensification has broken a part of those relations, degrading the points created throughout millenniums between the olive grove and nature. However, due to their structural characteristics, recovering biodiversity in olive groves is simple. The Living Olive Groves Project proposes a series of actions to restore the olive grove and its biodiversity, related to managing herbaceous covers, planting various indigenous, shrub and herbaceous species and creating functional elements to shelter fauna (installing nest boxes, creating ponds and water fountains, among others). These actions are carried out by volunteers participating in the project. To analyse the effects of said measures it is necessary to conduct previous studies that accurately measure biodiversity in the demonstration olive groves, before and after their implementation. This task is carried out through the Ecology Department of the University of Jaén and the Experimental Station of Arid Zones of the CSIC. These scientific entities are those that are responsible for performing a comprehensive inventory of the biodiversity of the olive grove and analysing its evolution throughout the project to be able to certify the improvements produced in olive groves with scientific data and methodology. The analysed groups are vegetable species, birds and arthropods, which will provide us a photograph of the initial state of the olive groves comparable to that which we will obtain at the end of the project. At the end of the same we will be able to scientifically certify the contribution of the Living Olive Groves Project to recovering the biodiversity of the olive grove.